A British Council programme taking place in Colombia, Kenya and Vietnam. Current and upcoming international opportunities for artists, creatives, professionals and organisations. Supporting projects that engage with the music or film heritage of Vietnam through contemporary mediums. A project funded by the European Union and implemented by the British Council in partnership with VICAS. As part of the British Council’s Heritage of Future Past project, we are delighted to present a series of events (symposium, workshops and screenings) around archival film materials. 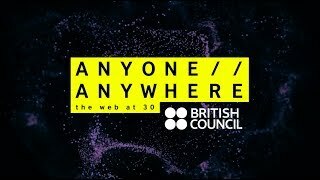 Our Anyone//Anywhere season celebrates the 30th anniversary of the web and takes a look at its past, present and future – where it’s come from, what state it’s in now and where it's going. Organised by the British Council and Ministry of Culture, Sports and Tourism on 7 November 2018, this is one of the key events of the Cultural and Creative Hubs Vietnam. Bringing artistic talents from the UK to perform in Vietnam has always been a part of the British Council’s work to promote friendly knowledge and understanding. A partnership project of the British Council, Leicester University and Hanoi Grapevine.